At first I only half-heard the German soldier. I was busy talking to a few of my friends as we stood on the street-corner near the bombed-out café, our hair rolled up stylishly and our lips all sporting various shades of bright red lipstick. “Fräulein!” The tone became more imperious. I glanced toward the soldiers seated at a table a few yards away, and realized the one speaking was looking in my direction. He motioned for me to come closer. My heart fluttered nervously as I pasted a small smile on my face and obeyed. The German sat there in his green uniform, a freshly lit cigar clamped in his teeth and a stoic, unreadable expression on his face. He wasn’t the one who’d been stopping other townsfolk on the street all day, demanding their identification cards…but that one wasn’t far away. I’d been keeping my identification card in my hat, because my dress had no pockets and I’d forgotten to bring a purse. But sometime around lunchtime it had disappeared. It must have fallen out along the street. My mind raced as I pretended to look for the all-important card, stalling, trying to decide what to do. But I could only think of one plan. (And it wasn’t a particularly good one.) When my hands came up empty I paused for a split second, took a deep breath, turned…and bolted. Behind me, the scene exploded into chaos as furious voices began shouting in German and one of the officers knocked a table over, angrily ordering pursuit. I sprinted down the sidewalk, holding onto my hat and wondering frantically if I should try to duck around a corner or perhaps disappear into the crowd on the other side of the street. And then, suddenly, I spotted something that made me skid to a halt. Armored vehicles advancing up the road toward me, manned by American soldiers! Within minutes, the chaos over my flight had been totally eclipsed by the chaos of a town under siege. Civilians dashed for cover. German soldiers shouted the alarm. The air filled with thundering gunfire and a haze of acrid smoke. Skinny jeans. And sneakers. And digital cameras. LOTS of digital cameras. Because after all, this wasn’t occupied France during WWII. It was Linden TN. In 2015. Ok. I’ll admit it proudly here and now. I love playing dress-up. Absolutely LOVE it. I own about as many costumes as I do everyday outfits. Colonial, Civil War, medieval, cowgirl, Scottish highland, Tolkienian elvish, you name it. And now, as of this fall, I’ve added a new category: WWll. An important part of every writing project is, of course, the research. I’m currently researching the 1940’s in order to authentically portray it in the biographical novel I’m working on. So what better way to research than to get involved with a WWll reenactment and put together an authentic outfit; learning about clothing, culture, makeup, and hairstyles along the way? That’s exactly what I did. And it was loads of fun! From seamed stockings to victory rolls, I’ve learned a whole lot about 1940’s women’s fashion, and how it was affected by the war. With a great deal of help and advice from my friend Kristen over at Verity Vintage Studio, I put together two different outfits, a day look and an evening ensemble, and went to Linden Tennessee to be a part of the Remembering WWll event held there in late September. WOW! What a fabulous experience! I’ve been to my share of re-enactments, but this was by far the best, most hands-on one I’ve ever participated in. 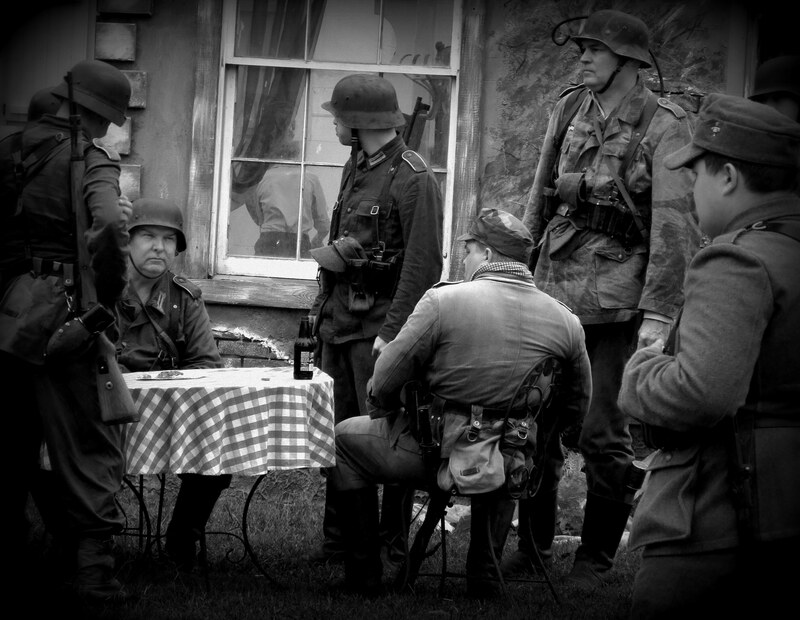 Hundreds of civilian and soldier re-enactors, multiple different shows and events, music, vendors, encampments, and more than a few WWll veterans. And the battle! Talk about impressive! The soldiers were literally fighting in the middle of the street while the spectators stood watching from the sidewalk! A-MAZ-ING! I’m so glad I got to be a part of it, not only because it helped me have a much more real-life idea of what the 1940’s actually looked and smelled and sounded and felt like, but because it was done with such excellence that being involved was an absolute privilege. 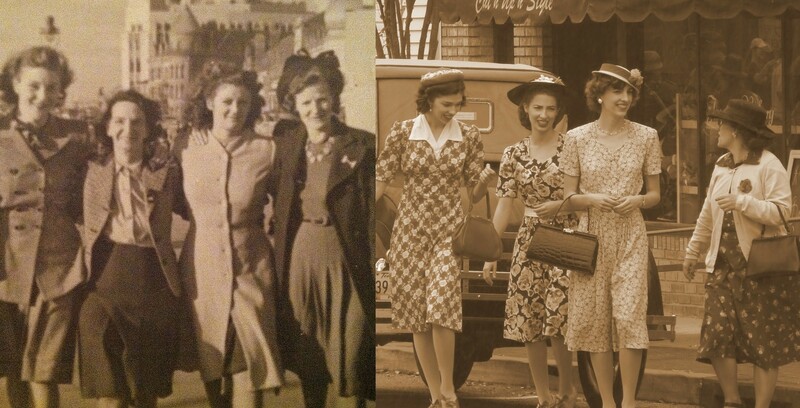 If it wasn’t for the difference in photo quality, it might be a challenge to guess which girls really lived in the 40’s and which live in the 21st century! Looking forward to going back next year! I was one of those across the street with a digital camera. You’re description is perfect – it was a fantastic day! My husband and I will be there next year, and look forward to seeing all of you again. Thanks, Alice! So glad you enjoyed the post. It’s great to connect with another attendee! Next year is definitely something to look forward to. I’m already planning another 40’s outfit! My sister and I met you there and I was hoping to see you again at another WWII event the next weekend in GA, but we couldn’t make it due to the flood! I’m excited to see your blog and love your picture at the top, it’s so beautiful! Looking forward to reading your blog! Hello Annie! So glad to reconnect! It’s probably a good thing you didn’t come to the re-enactment in GA after all. It was pretty much rained out. (Except for the hanger-dance Friday night, which was fun.) Almost nothing on the schedule actually happened due to the torrential downpour that rolled in on Saturday. The military re-enactors left early, the parachute jump and plane rides were canceled. Even the parade didn’t go! They told us that in the something like 15 years they’ve been doing the event, this was the first time it’s been rained out. So hopefully it will be back and better than ever next year! Leya, I know this comment is rather late, but did you know that this blog post was posted on Remembering WW2’s Facebook page? Yes I did! I had quite a few readers find me that way.